There are actually dozens of potential real estate marketing strategies you can use to introduce yourself as a real estate agent to your local area, including social media marketing, real estate video marketing, publishing a monthly newsletter, and content marketing (having your articles published on websites related to real estate marketing, home ownership, the local real estate market, the desirability of living in your community, and so on). As you’ve heard countless times, prospects generally need to be exposed to your name, your face, and your message several times before being receptive to doing business with you. One of the most important principles in real estate marketing is that people gravitate to Realtors and real estate agents who they know, like, and trust. Building recognition, credibility, and trust is an ongoing, gradual process comparable to building a house. You start with the foundation, construct the framework, and then methodically create a cohesive and long-lasting structure from there. In many ways, a real estate agent introduction letter is like the foundation of a new building. The intro letter sets the stage for future contacts and it opens the door to inquiries, lead generation, and potential client relationships. Although “canned” real estate introduction letters can sometimes be a turn-off to potential clients, you can use marketing letter templates to your advantage by personalizing the content in them. A website I’m affiliated with, called “My Real Estate Letters“, offers an extensive marketing kit for new agents and Realtors, consisting of 12 different versions of real estate introduction letters, as well as professionally written real estate prospecting letters, thank you letters, real estate newsletter content, and an assortment of farming letters and relationship-building tools. Aside from the need to be self motivated, extremely knowledgeable, and service oriented, likability and credibility are two key catalysts that determine success for real estate agents. There is a formula for real estate marketing success, and a fundamental part of that formula is the public’s perception of you. Your chances of winning over prospective real estate clients is strongly influenced by whether those prospects know you, like you, and trust you. Being “known, liked, and trusted” are of such paramount importance that those priorities should be focal points of any real estate marketing strategy. Expanding your visibility and establishing credibility are two branches of that strategy, which can help you create momentum and be more effective in all your marketing efforts. Visibility is crucial for creating top-of-mind awareness, and credibility is a necessary component of trust. Here are 10 real estate marketing ideas and strategies for creating and reinforcing visibility, name recognition, and credibility in your farming area and local community. Distribute press releases: I used to be employed in the public relations field, so I have a relatively high comfort level using marketing tools like press releases and media advisories. Submitting press releases to local media outlets is actually simpler than you might think. First of all, the press announcements have to be considered somewhat “newsworthy” and not blatantly self promotional. Press releases can be either e-mailed or postal mailed, and should answer the journalistic questions of “Who? What? Where? When? Why? and How?” The information in a press release should generally be organized in order of descending importance, and include a headline, the date, who to contact for more details, and a boilerplate paragraph at the end of the announcement about you or your agency. Mail out real estate prospecting letters: Professionally written marketing letters can be an integral part of a well orchestrated real estate marketing plan. Whether you’re sending out a real estate agent introduction letter to your entire farming area or targeting a specific group of prospects, such as expired listing home owners or FSBO prospects, reaching out to people, via email or postal mail, is a proven lead generation technique. 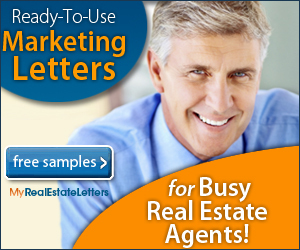 If you’d like to save time and maximize the effectiveness of your real estate prospecting letters, check out a professionally created kit of real estate marketing letters for agents and Realtors that I’ve been featuring on my blogs and website for years*. Real estate postcard marketing: Postcard marketing is a time-tested method for generating leads, getting your name and photo out there, and increasing your visibility in a real estate farming area. According to Jeff Charlton, the author of Real Estate Postcard Marketing’s Best Kept Secrets*, the reasons many postcard marketing campaigns produce disappointing results are a lack of originality, a failure to create high perceived value, and mediocre postcard designs. Real estate video marketing: As your clients, prospects, and other real estate agents continue to become more Internet savvy, real estate websites that feature video presentations will have a decided competitive edge, in terms of being more engaging, captivating, and professional looking. Posting real estate marketing videos on video sharing websites, such as Youtube, can also help you generate more website traffic, sales leads, and online visibility. Appearing in a real estate video — assuming you’re comfortable in front of the camera — can also increase your recognition factor, personal branding efforts, enhance your credibility, and reduce sales resistance when you meet prospects in person. In some cases, it will have the effect of turning a cold call into a “warm call,” because if they’ve seen you in a video, you won’t be perceived as a complete stranger. Real estate business cards: Perhaps the cheapest, yet most valuable real estate agent marketing tool you’ll every use is your business card. It pays to hand them out liberally and make sure they’re always professional looking and up to date. Real estate marketing materials: In addition to business cards real estate marketing flyer templates, there are other cost-effective ways to market yourself, such as real estate door hangers, brochures, mini calendars, greeting cards, exhibits at trade shows and community fairs, and first-time home buyer kits. Thanks for checking out my latest marketing ideas for real estate agents, including real estate prospecting letters, blogs, newsletters, public relations methods, and other cost-effective real estate marketing strategies. Stay tuned for more real estate marketing tips over the next few days. *Disclaimer: My blog posts features links to digital products, marketing templates, websites, and services for which I am a compensated affiliate. Whether you’re a new real estate agent or a Realtor focusing on expanding your marketing reach, this blog will offer some solid real estate marketing ideas, tools, and strategies aimed at helping you generate more leads and sales. Real estate marketing letters, which include prospecting letters, introduction letters, thank you letters, requests for referrals, and real estate marketing letters that make reference to a mutual acquaintance. Real estate postcard marketing, which can be subdivided into three different categories: “just sold” postcards, “just listed” postcards, and real estate advertising/ marketing postcards that have a catchy photograph and headline on one side and a “call to action”, an effective marketing message, and your contact information on the other side. Real estate email marketing: The ideal real estate marketing campaign includes a method of gathering e-mail addresses of prospects who have expressed interest in receiving updates, announcements, and newsletters from you. One way of gathering email address is by using an autoresponder system, which is typically included in most e-mail marketing programs that you can subscribe to, like Constant Contact, Mail Chimp, GetResponse, AWeber, and Fluttermail. Real estate advertising: Keeping in mind that most buyers and sellers of real estate tend to search online for real estate agents and homes for sale, websites like Trulia and Zillow are worth considering when planning a real estate marketing campaign. Web-based real estate marketing: A vital component of any web-based real estate marketing program is having a professionally designed website that’s optimized for the major search engines, primarily Google. In addition to being updated on a regular basis, an effective real estate marketing website should also include an autoresponder I referred to earlier. It’s basically a short form website visitors can fill out and submit to be included on your mailing list. Building an opt-in list of prospective real estate clients is a key aspect to any well-planned real estate marketing plan. Stay tuned to this blog for more real estate advertising/marketing ideas. Thanks for stopping by.